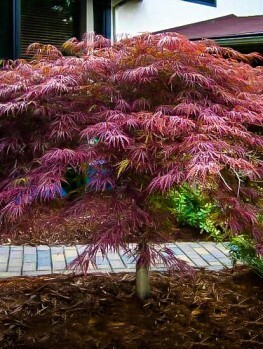 Japanese Maples are the most desirable garden trees that exist. 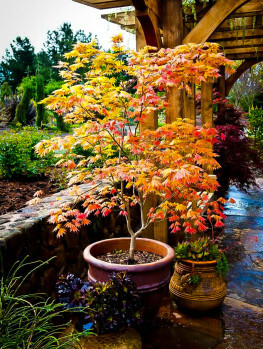 A tree in fall is guaranteed to turn heads and gather admiring looks and the enormous variety of leaf forms, colors and tree shapes means that no matter what your taste or space restrictions, there will be a tree for you. Some grow into small trees 20 feet or more in height, others remain as low shrubs reaching five feet only after many years of growth. 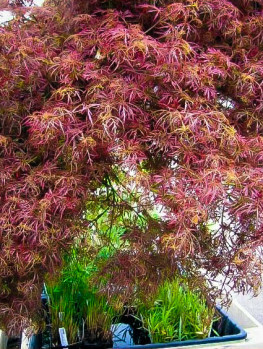 They may be upright in form, pendulous or cascading, with red or green leaves and as well as their stunning fall coloring, many have remarkable colors on their new spring leaves too. 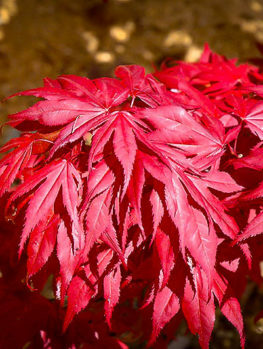 There are also a wide number of varieties with red or purple leaves all summer, which bring a unique highlight to any garden. These trees have a reputation for being hard to grow, but this is largely undeserved. With attention given to their location in the garden and some minimal care, they will thrive and increase in beauty every year. 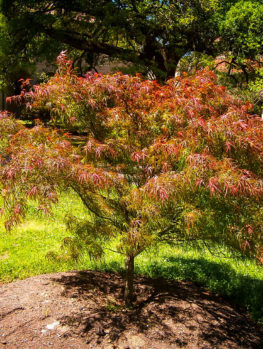 Compared with many other trees and shrubs, they have few pests or diseases and are versatile enough to thrive in locations ranging from full shade to full sun. They can be grown in the garden, in containers and of course they are ideal subjects for the ancient Japanese art of bonsai. 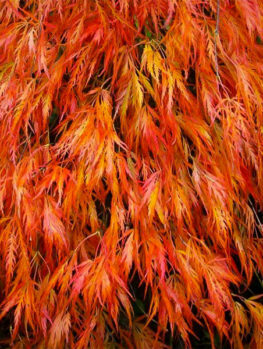 Japanese Maples grow wild across the hills of Japan, Korea and into Mongolia and Russia too. As a wild tree it grows 20-35 feet tall, occasionally more, and usually has several trunks, rather than a single central trunk. 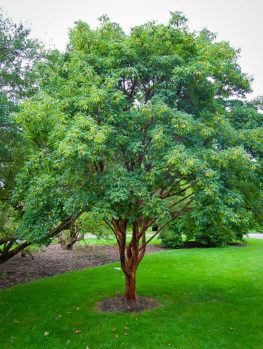 The bark is smooth and gray on older limbs, but green, red or sometimes pink on younger shoots. 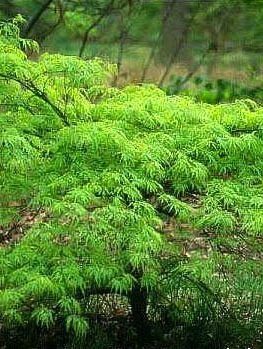 This tree grows in the shade of larger forest trees, which is why it is more shade-tolerant than most other deciduous trees. 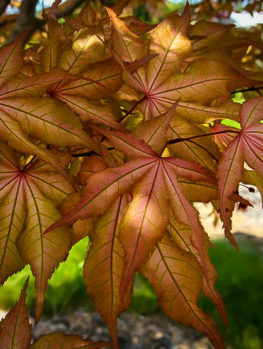 Being a Maple tree it has the typical lobed leaf, with veins spreading out like the fingers of a hand and ending in five to nine lobes, with one lobe in the center of the leaf. 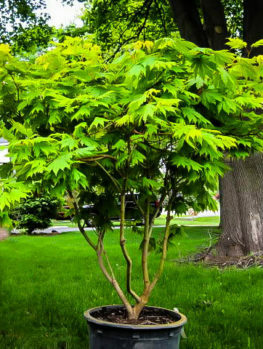 However, the leaves are much smaller than on typical Maple trees and since many garden forms have deeply divided leaves they may not be immediately recognized as Maple trees. 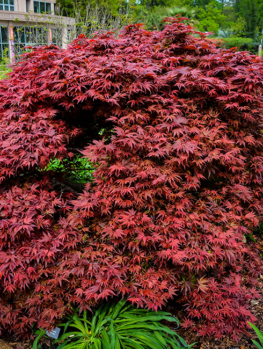 Japanese Maple produce small flowers in spring and the seeds are the small ‘keys’ typical of all Maples, which twirl down to the ground in fall. 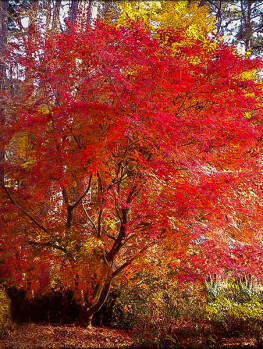 For many centuries the Japanese people have traveled to the countryside to see the fall color, like east-coast Americans admiring the Sugar Maple. More than an excuse for a picnic, momiji-gari is considered a lofty spiritual experience. Unlike many plants, where each individual is very much the same as another, these trees are naturally very variable, with different leaf-forms, colors and tree shapes. Japanese gardeners began to collect these forms, and produce more from seedlings, so that today at least a thousand different forms are known. Many forms were developed in Japan and these of course have Japanese names, while others were bred in Europe or America and usually have English-sounding names. Although some purists only grow original Japanese varieties, many of the best and most popular were developed in the West and have been introduced back into Japan. 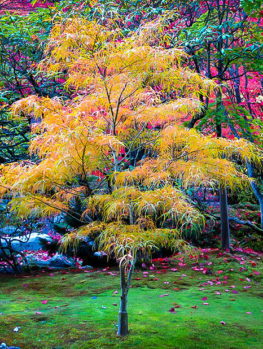 In the 19th century travelers and botanists began to bring trees back from Japan and they quickly became very popular with gardeners in Europe and America. 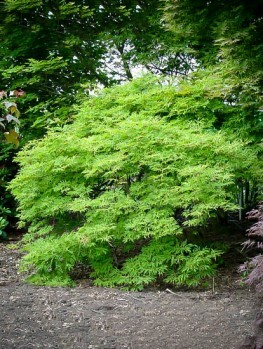 The Swiss botanist and doctor Carl Peter Thunberg named the tree Acer palmatum, because the leaf looked like a hand. 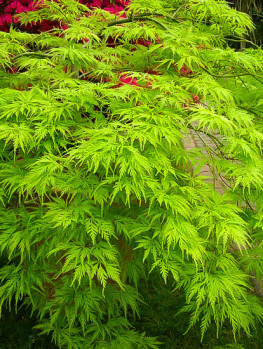 The Japanese name momiji means the hand of a baby. 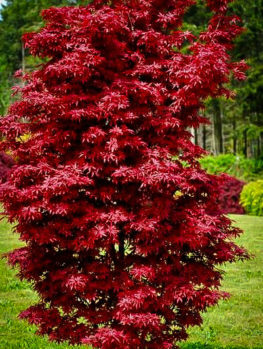 Of the many forms introduced and bred, the most popular are those with red summer leaves; those with finely divided leaves; and those that are pendulous and cascading. 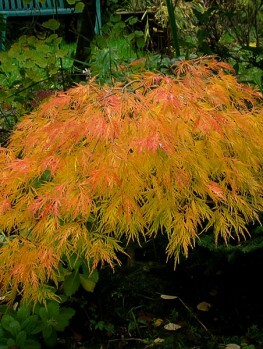 However many of the other forms are very worthwhile garden plants, including forms with colored winter twigs, unusual leaf shapes and ones grown for particularly spectacular or unusual fall coloring. So making a different choice from the main-stream will always bring something special and unique into your garden. 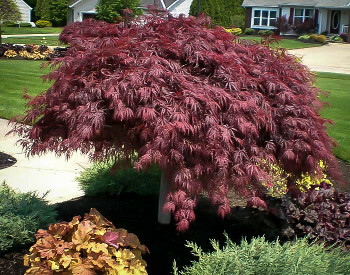 In gardens Japanese Maples are hardy from zone 5 to zone 8, with some being hardy into zone 9. Some varieties will thrive in zone 4 as well. In areas that are too cold the branches may suffer from damage in winter and die, although often the main stems will re-sprout. In hot regions the main danger is heat and sun-scorch, which can cause the leaves to shrivel in summer. When this occurs trees will sprout normally the following spring. Growing trees in shadier locations and making sure they have sufficient water will normally prevent this problem in summer. In very warm areas there may not be sufficient winter cold to stimulate the buds to re-grow and this does make it impossible to grow these trees in tropical and sub-tropical places. 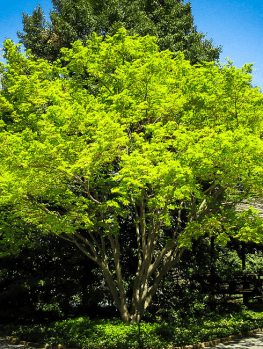 With the move to smaller gardens and tiny town gardens there is often a need for a tree, but most shade trees grow too large for small spaces and quickly become problems that mean they have to be removed, often at considerable expense. 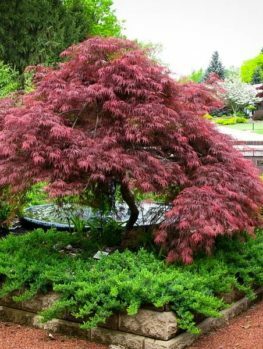 The larger forms of Japanese Maples make ideal small trees, staying less than 15 feet tall for a long time and only very slowly reaching 20 feet or more. With some pruning they can be kept small indefinitely. This also makes them ideal for growing in planter boxes and large containers too, where they can be moved around as needed and where they will not have to compete with larger trees for water and nutrients. 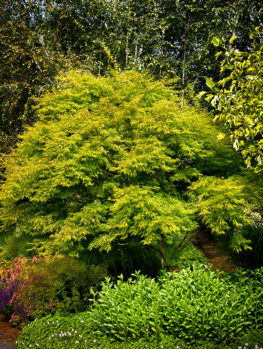 In larger gardens they are ideal for growing under mature, large trees and will thrive happily in the shade of deciduous trees, where they can be grown directly underneath them. Beneath evergreen trees they can be grown on the north-facing or east-facing side, in the shadow, but they will find the continuous shade directly underneath dense evergreens less than ideal. Beneath open pines and trees that do not have dense shade they will however grow well. 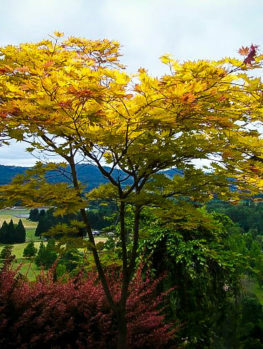 These trees can also be grown in full-sun and there they will develop a denser crown and often show stronger fall colors. In cooler areas this is an ideal location but in warmer regions it becomes more likely that the leaves will dry and shrivel, so shade, especially from afternoon sun, is best in zones 7, 8 and 9. Choose a location where you tree can easily be seen, so that you can enjoy it at any season. Cascading trees look very beautiful on slopes or by water, while upright trees make great background plants or specimens. They make beautiful companions for other shade-loving plants like Azalea, Rhododendron, Holly and Hemlock. 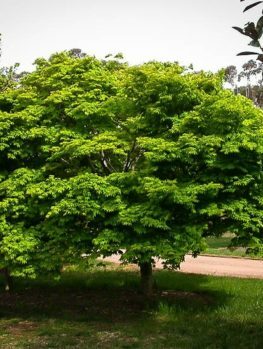 A beautiful and special garden can be created beneath large shade trees using these plants, which will be interesting at all seasons of the year. 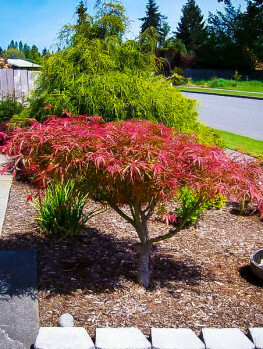 If you have a courtyard garden or just a deck or terrace, you can successfully grow a Japanese Maple by planting it in a container or planter box. 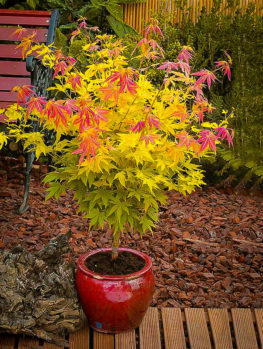 For a young tree this does not have to be very large, but remember that smaller pots need more frequent watering, especially during the summer months. All sorts of containers can be used, but make sure that whatever you use has a drainage hole. Trees in containers can be moved around so that they can be admired at special seasons and also to give them more, or less, direct sun depending on the season. 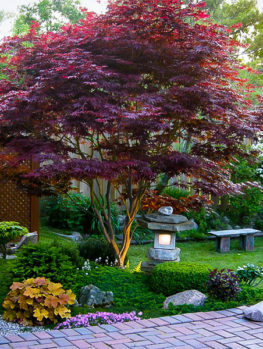 Although in the minds of many people these trees are connected with oriental style and Japanese gardens, in fact they can and do fit well into almost any garden style, so don’t think that you have the ‘wrong’ garden for them. 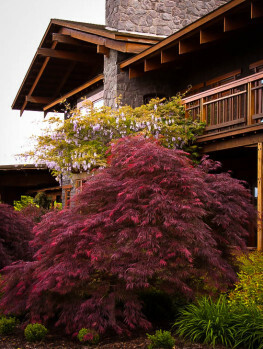 From woodland gardens to town courtyard gardens, these trees always make a special impact. 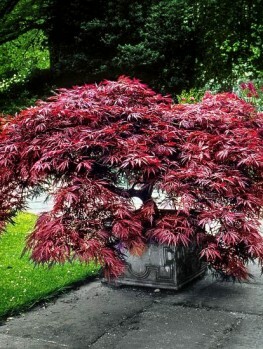 One of the best things about a Japanese Maple is that they become more and more beautiful as the years go by. 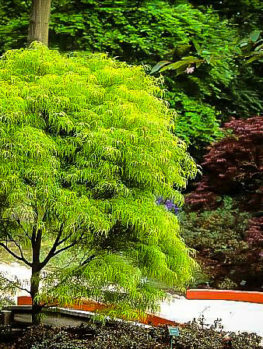 Old, mature trees have a dignity and grandeur that cannot be beaten and they also become valuable assets. Old trees sell for thousands of dollars. 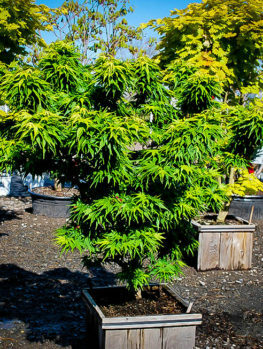 For some the highest use of this wonderful tree is to grow it as bonsai. This ancient Japanese and Chinese art uses living trees to create beautiful art objects that can grace a terrace or a dining table. In Japan, houses have special niches for displaying objects and bonsai trees are often brought indoors to show their beauty. Bonsai is a specialized form of gardening that is not difficult but takes some special knowledge. 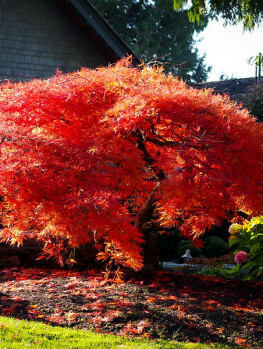 Any Japanese Maple can be used, from upright to cascading, and the training enhances the natural beauty of the tree. 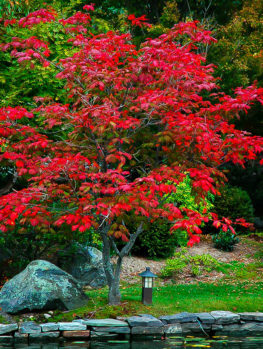 If trees are grown indoors as bonsai they must spend some time outdoors or refrigerated in winter to keep them healthy. In Japan bonsai trees are grown outdoors and only brought inside for short periods to admire them. 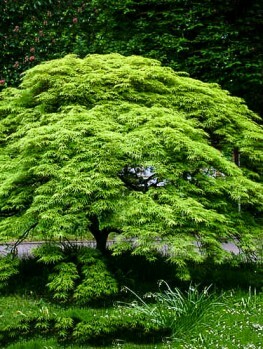 Just as they do in the garden, trees as bonsai become more beautiful and more valuable as they mature. Choose the location carefully when planting your tree. Protection from afternoon sun and drying winds is helpful in all but the coolest areas, although some varieties are more heat resistant than others. 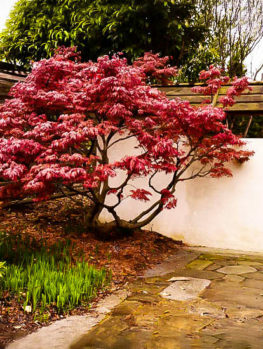 If you are planting a cascading form, a slope, bank or the top of a wall will show the beauty of this tree better than planting it on flat ground. Caring for your new tree begins with preparing the soil. 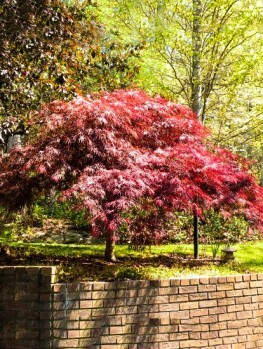 Your tree will do well in most kinds of soil, as long as it does not stay wet for long periods. Flooded soil is not suitable. Whatever the soil you have, your tree will do better if you add a generous amount of organic material before planting. This can be garden compost, well-rotted animal manures like cow, sheep or horse manure, rotted leaves or peat-moss. One or two buckets of material should be dug well into the soil where you tree is going to be planted. Add some bone-meal, rock phosphate or superphosphate to give good root growth. For planting in containers or planter boxes, make sure your container has drainage holes or it will be impossible to stop the soil from flooding and killing your tree. Holes can be drilled in most containers – for ceramic ones use a slow-speed drill and a masonry bit, making a small hole first and then enlarging it with larger bits. Use a potting soil for outdoor planters and top-up the pot each spring with fresh soil. When planting, make sure you use plenty of water during the planting operation. Do not plant into dry soil and then just sprinkle the surface afterwards. Mulch of a rich organic material should be put on over the whole root area after planting. For the first year or two, make sure to water your tree regularly, once a week from spring to fall and twice a week during hot weather. In warm areas winter watering may be necessary during sunny and dry periods. 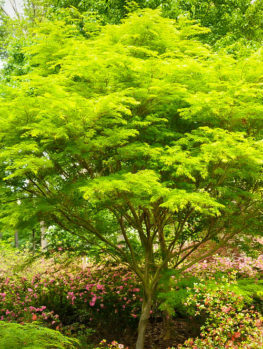 Your tree will not need staking, but if you are growing a cascading form it is possible to create a taller tree with a very attractive form by staking a few branches upright, keeping them staked until they are firm and support themselves. 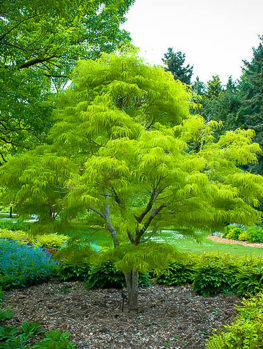 This will create a multi-tiered tree that is very attractive and eye-catching. 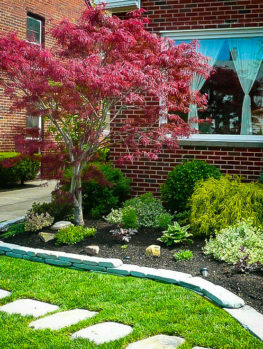 In spring renew the mulch and apply a small quantity of tree fertilizer, scattered over the whole root zone. Young trees also benefit from liquid fertilizer during the early years, applied in late spring and early summer. Trees in planters and containers should be fed with a liquid fertilizer once a month from the time growth begins until late summer. Be careful to follow the directions and use a half-strength solution or the foliage may burn. 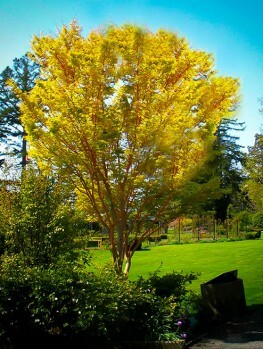 Do not fertilize a dormant tree as this may stimulate sudden new growth which could be damaged by frost. Water trees in containers whenever the upper inch or so of the soil becomes dry. Always water thoroughly until a little water comes through the drainage holes. Pruning is not normally required, except for removing any small branches that may naturally die as the tree develops. 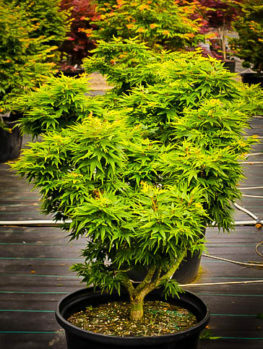 Long shoots can be trimmed back a little to encourage denser growth, but trimming and heavy pruning could destroy the natural habit of your tree, which is its greatest asset. 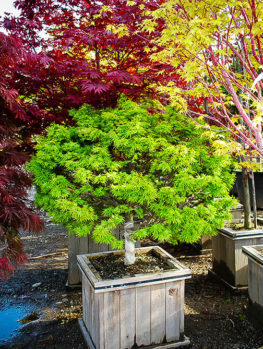 Trees in containers may need more regular trimming to keep them within the space available, but unless you are growing bonsai, trimming is one chore you can forget with your Japanese Maple. If you enjoy pruning and trimming your plants, some growers do prune their trees to develop a more mature appearance earlier than would happen naturally. The time to do this is in winter, when you tree is dormant – February in cooler areas and January in warmer regions. 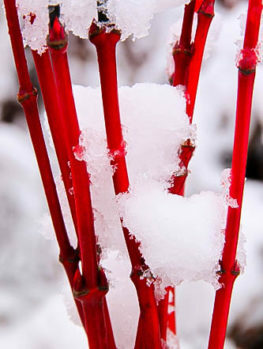 Remove small branches coming from the lower parts of the major stems and any branches that are crossing or rubbing against each other. Leave branches where you want to have major limbs, spacing them out so that the tree looks more open and even a bit sparse. Shorten back long stems to encourage denser growth. Always cut just above a pair of buds. 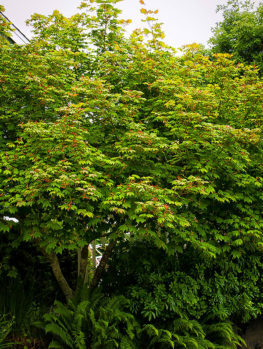 A second trimming of new shoots in early summer will also help your tree to look more mature. 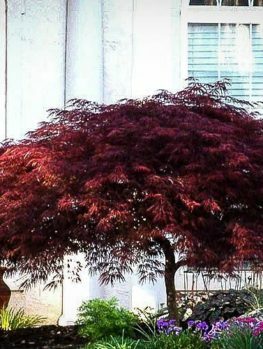 Look at the pictures of mature trees of your particular variety to see what a mature tree looks like and try to prune your young tree in that way. This varies from quite large and full to small and delicately divided into many narrow threads. Almost all trees showing attractive fall color, with some trees being grown specifically for this. 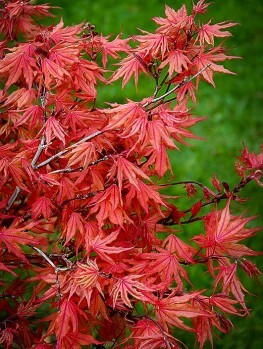 Others have red leaves in spring and summer and these are perhaps the most popular. 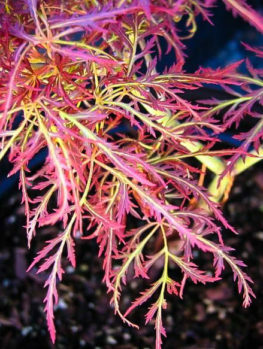 Some varieties also show strong colors in the new leaves, which can be pink, orange, red or even white in spring. These colors may change into red or green during the summer. 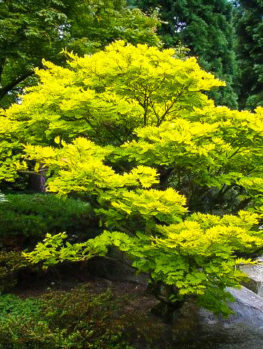 Some trees also have variegated leaves, in yellow and green. Some trees have upright branches and look like ‘regular’ trees, while some have horizontal branches, forming a low, wide tree. Others have branches that fall at lower angles, forming pendulous, weeping and cascading forms. Because of their relatively slow growth rate, and depending on climate and growing conditions, it can be hard to predict the ultimate size of a tree. Some will grow into small trees perhaps 15-25 feet tall, while others, especially cascading forms, remain low and spreading forever and may never even reach five feet in high, although they can be much wider across. So we will look at some specific types, especially the most popular and available ones. 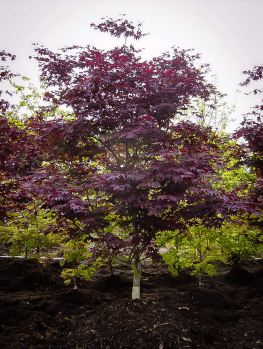 With such a wide variety to choose from there is sure to be the ideal tree for your particular needs and desires, not matter where you live or what you garden is like. 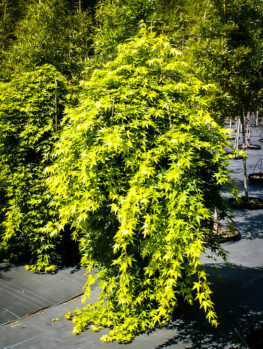 There are a whole range of varieties which grow into upright, multi-stemmed trees between 10 and 25 feet tall. These usually mature into trees with a rounded crown, nearly as wide across as they are tall. Trees in shade will be narrower and more upright than those grown in full sun. 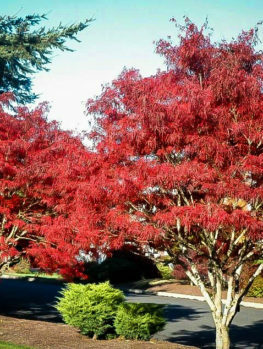 These trees are the ideal choice for a smaller shade tree and all have spectacular fall coloring. Some of the most popular have red foliage all summer long, but the green-leafed forms should not be neglected as they have a lot to offer. Coral Bark: A unique tree that brings a whole new dimension to these remarkable plants. 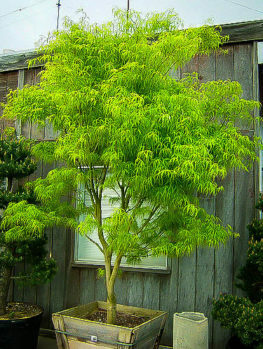 Also known as ‘Sango-kaku’, it forms an upright tree with green, divided leaves that turn a perfect butter yellow in fall. But it is in winter, when the garden is sleeping, that this tree really stand out, as the younger branches and twigs are brilliant coral pink from the day the last leaf drops to the moment when the new leaves emerge in spring. 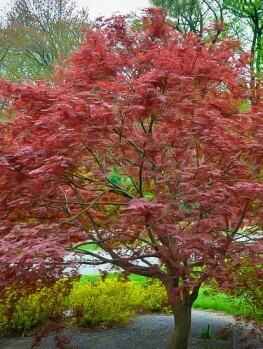 Winter in the garden can be boring, so a tree like this is just the thing to bring interest to the drabbest of seasons. This is also one of the easiest and undemanding of all the varieties, requiring no special care at all, so for the beginner that makes it the perfect choice. 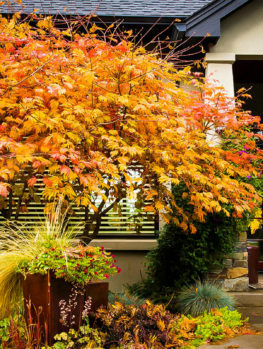 Osakazuki: The perfect way to bring vibrant fall color into a small garden. 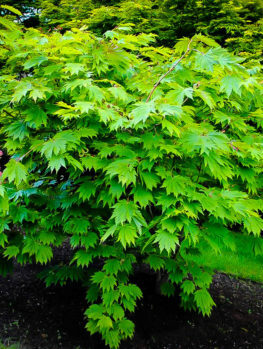 This is one of the fastest-growing Maples and it will be almost 20 feet tall in ten years, eventually reaching perhaps 25 feet, with a rounded but upright form, perfect for the smaller garden. 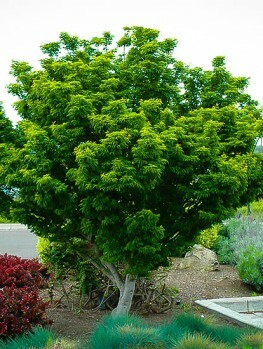 This is a tough, hardy tree that will thrive in light shade and it is the ideal courtyard tree. 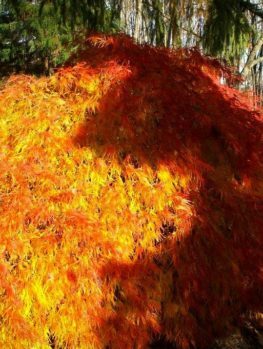 With elegant green leaves in summer, it turns the most amazing palette of gold, orange, red and copper every fall – truly a remarkable tree. Bloodgood: This is probably the most well-known and widely grown variety, and there is a good reason for that. This is the hardiest variety of all, growing happily with winter lows of minus 30, but also happy in hot summer weather. So for gardeners in zone 4, Bloodgood is the premium choice. In time in can grow into a tree 20 feet tall, with an upright habit and semi-horizontal branches. 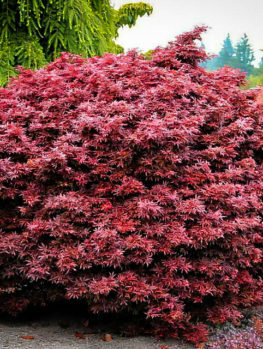 The leaves are not as finely divided as some other forms, giving more substance to the tree and they are deep pink in spring, purple-red in summer and crimson in fall. 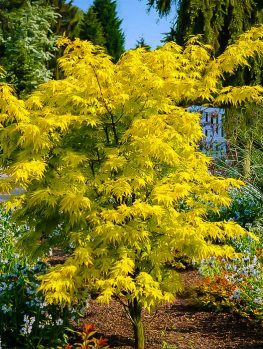 The tree will grow well in shade, but in colder areas it also grows well in full-sun and there it will have the strongest summer color. 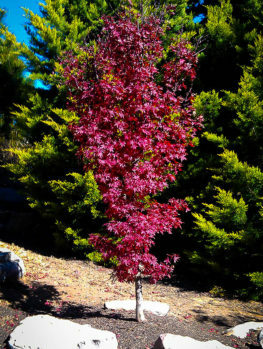 Emperor (‘Wolff’): This variety will grow into an upright tree about 15 feet tall, holding its purple-red leaf color from spring to fall, when it ends the season in a blaze of scarlet. It is also very fast growing, so a worthwhile specimen will develop in just a few years. It has another unique quality that makes it very useful in colder areas. Sometimes a tree will survive winter without any damage, but if you live in an area with spring frosts, early shoots on your trees and shrubs can be damaged. This tree is slower by a couple of weeks in leafing-out than other varieties, so it is much less likely to be damaged by a late frost. If that is a feature of your area, this tree is the number one choice. 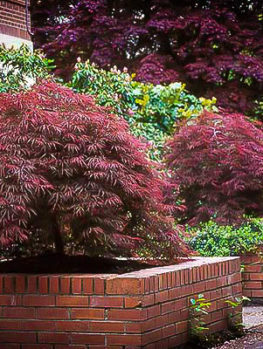 Purple Ghost: One of the smallest of the upright Japanese Maples, growing into a tree that is rarely more than 10 feet tall. 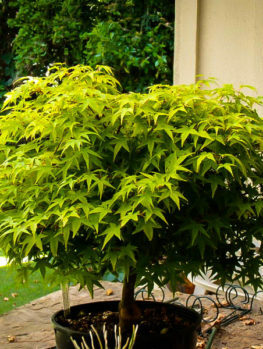 So if you have a small space or are looking for a tree for a large pot, this is the one to choose. 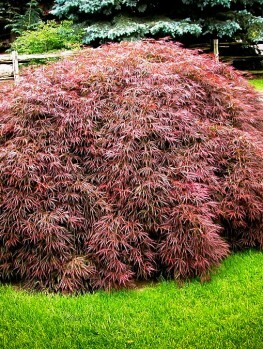 It has rich purple-red leaves that keep their color well all summer, before turning brilliant crimson in fall. Sherwood Flame: Remarkable not only for its beautiful red leaves all summer, but for also having the most vibrant fall display of all the red-leaf forms. 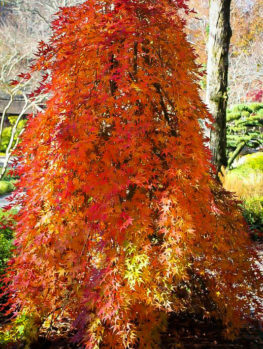 Not content with just turning a brighter red, this tree bursts into a blazing crimson bonfire in your garden every fall. While other trees are plain in winter, this tree is known for flowering at a young age and producing a heavy crop of delightful red maple keys, that festoon the branches well into the winter, bringing its own decorations to the festive season. 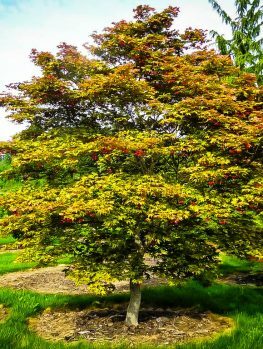 The summer color of the star-shaped leaves will not fade and this tree’s rounded but upright habit will not overcrowded the smallest garden, as it rarely grows above 15 feet tall. 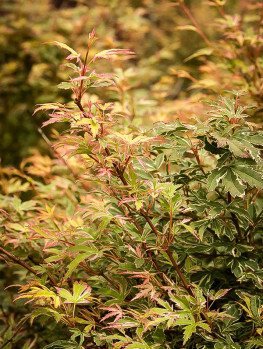 Some varieties have a semi-upright habit, forming a rounded dome with slightly weeping branches, often growing from one or several mainly upright stems. 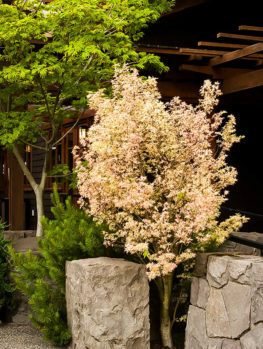 These form medium sized shrubs that are excellent specimens in shrub beds or as part of foundation plantings, as well as being attractive in planters and pots, among rocks or around a pond. Other forms have branches that hang down and make a mound of stems, unless staked to make them more upright. These cascading forms are best grown on banks or at the top of walls where they can be seen in all their glory. Crimson Queen: This is probably the top-pick of the red-leaved, weeping forms, growing into a large shrub ten feet tall and about the same across. 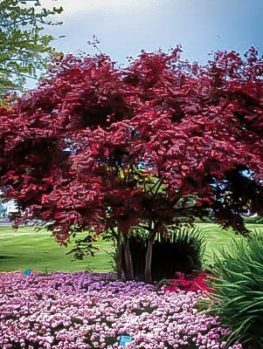 This tree is known for holding its red leaf-color through the summer better than any other form, even in shade, making it certainly the best choice for those locations. It turns bright red in fall. The branches are weeping, creating a graceful rounded form even in young trees. Inaba-shidare: A large shrub or small tree with an upright trunk and weeping smaller branches, so that it forms a broad, rounded tree. 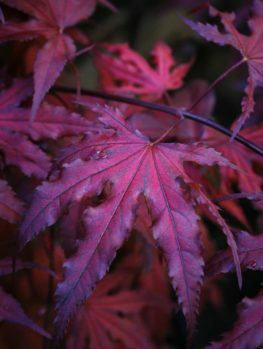 The finely-divided leaves are very dark purple-red in spring, gradually becoming lighter and more vivid as summer comes and then ending in fall a fiery crimson red. 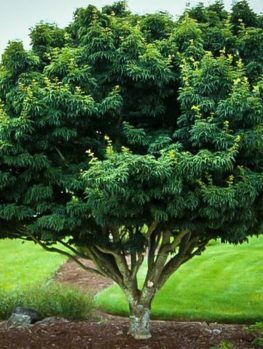 This tree is fast growing, so it quickly becomes a real feature in your garden, thriving in sun and partial-shade. 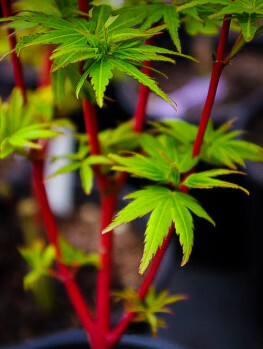 ‘Inaba-shidare’ has to be one of the top picks of the red-leaved trees. 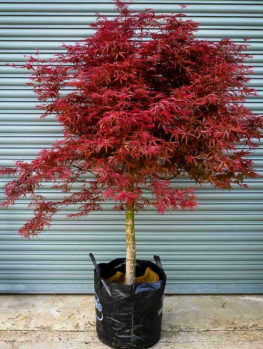 Red Dragon: The perfect choice when you have a sunny location and need a tree that will not scorch. This variety is the most sun-tolerant form available and will stay fresh and happy in sunshine all day long. 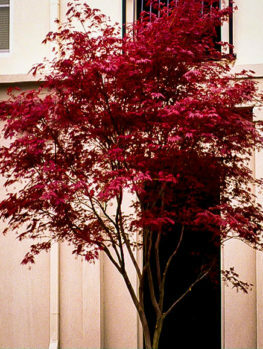 The leaves emerge cherry-pink in spring, turn red for the summer and become crimson in fall – a glory all year round. The tree is rounded to cascading in shape, and some summer watering is worthwhile in very hot locations. 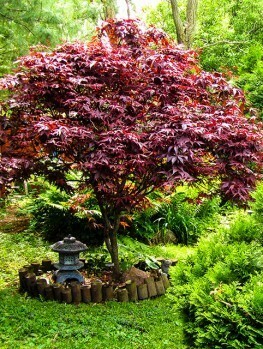 Garnet: Unique for its remarkable leaf coloring, this small, weeping tree has leaves that emerge in spring a vibrant shade of red-orange. 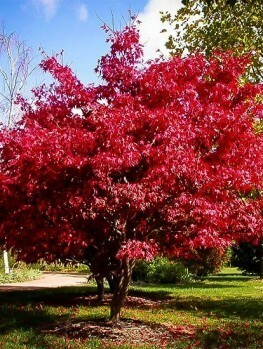 Remarkably, this color does not fade, but is retained all summer long, before turning the richest deep red in fall. Garnet remains small, with a perfect weeping form, making it ideal on a bank, at the top of a wall, by a pond or in a tall pot. It is shade tolerant and also thrives in warmer, more humid climates than many other varieties. It will grow into a shrub just 6 to 9 feet tall, but 8 to 12 feet wide, so leave room for it to spread. Green Cascade: The name says it all. 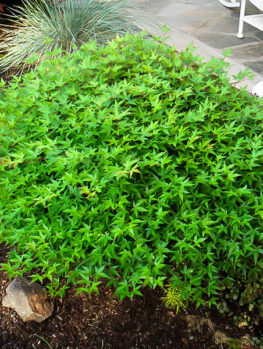 It will grow into a cascading shrub just 5 feet tall but up to 8 feet across. With its cascading habit it is ideal planted at the top of a wall or on a bank, or in the foreground of a shrub border. It does well in warm areas and because the leaves are larger than in many other varieties it is especially resistant to sun, so it is ideal for the sunniest spot in any garden. The leaves may be green all summer, but when fall comes this tree pulls out all the stops and becomes a kaleidoscope of gold, orange and shades of red. 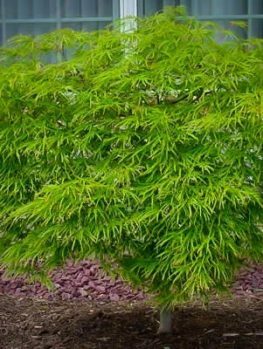 Green Mist: Features the most finely-divided foliage of almost any of these remarkable trees, so fine that the tree resembles a cloud floating in the garden. 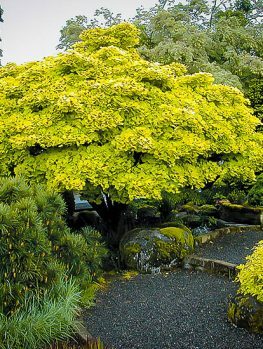 A fully cascading form, this tree will flow across the ground on any slope, or spill over a wall or boulder in a delightful way. 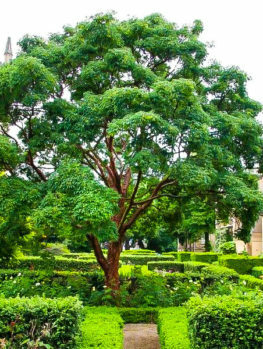 Because the foliage is so fine, it is best to grow this tree in a well-watered location, with shade from the midday and afternoon sun. 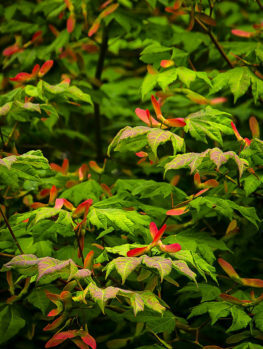 Despite the fineness of the leaves it will grow well even in zone 9 if planted in shade. Tamuke-yama: The fastest growing of the cascading forms. It is also the most heat resistant and so the ideal choice for hotter, humid areas. 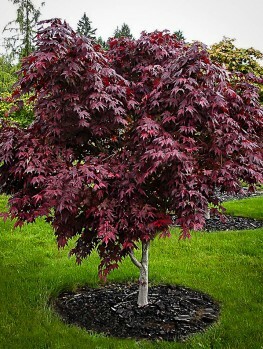 The leaves are reliably purple-red all summer, turning crimson in fall. 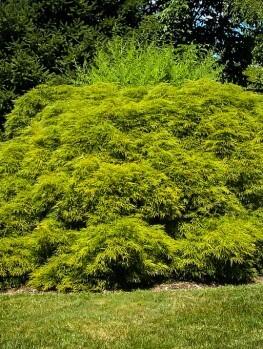 With its rapid growth rate it will soon become a feature in your garden, but as it slows with maturity it will never be more than 8-10 feet across. Growing well in sun and shade, for southern gardeners this is the tree of choice. Waterfall: The ultimate variety for cascading forms. No other tree has such a full, cascading habit of and it will literally stream down a bank or wall, exactly like a green waterfall. The foliage may be a restful green all summer, but in fall it lets loose with a riot of yellow, gold, orange and red that will rival the most colorful of fall trees. It is perfect on a wall or bank, where it can spill in every direction. Weeping Viridis: Larger than many other cascading forms, so it is the ideal choice for a larger property. 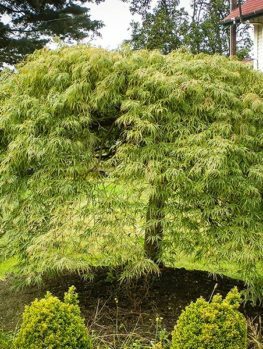 It will grow to 10 feet tall and 10 feet across, with weeping branches falling to the ground. The leaves are cool green all summer, and then they turn vibrant yellow, orange and scarlet in fall. 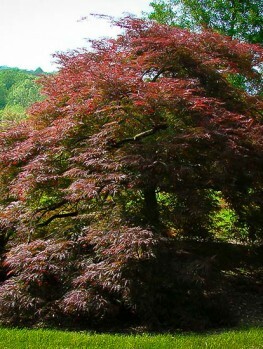 For a reliable, weeping form this is an outstanding and unique tree that makes the perfect complement to the more common red-leaf forms. Some trees do not fit neatly into the ‘upright’ or ‘weeping’ categories and have some other unique feature that sets them out as special. This may be unusual leaf forms, a different way of growing, or some other feature. 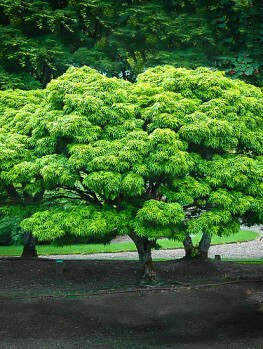 Lion’s Head (‘Shishigashira’): A very special tree that is rarely seen, but deserves to be grown more widely for its unique appearance. 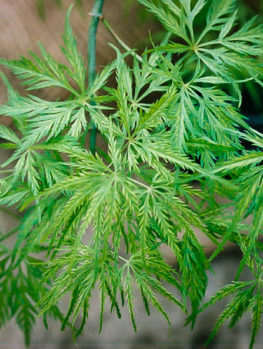 Unlike the delicate shape of most forms, it has a bold, upright presence, with rounded and crinkled leaves. The shoots and leaves cluster on the upper parts of the branches, so that a tree looks like the shaggy mane of a noble lion. Fall color is gold to red on this special tree. 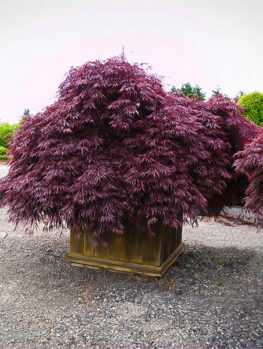 Despite its rugged and bold look, this tree remains small and is ideal for a unique container plant – especially in an Asian-themed garden, but also making a remarkable statement in any location.